Congratulations to our Upper School Jazz Messengers, Madrigals Chorus and the Jazz Crusaders for their outstanding performances at the 51st Annual Berklee High School Jazz Festival this past Saturday, January 26. Fifty-nine Trinity students in all, performed! Murat Gulcelik, bass guitarist for the Jazz Messengers, Tyler Bonaparte, drummer & percussionist for the Jazz Crusaders, and Naia Wolfenzon, vocalist for the Madrigals Chorus received performance awards for their respective ensemble. Naia Wolfenzon received an additional outstanding vocal soloist award in the overall vocal category. 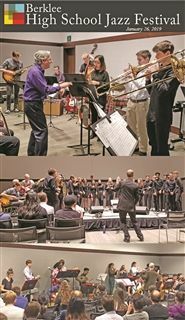 Berklee College of Music hosts this High School Jazz Festival at the Hynes Convention in Boston, Massachusetts.